Although we know some plants don’t like winter conditions, we don’t always think about exactly what it is that threatens them. Winter winds and sun desiccate the exposed parts of shrubby plants. Frozen ground prevents plants from taking up water to rehydrate themselves. In combination, these can kill or seriously weaken plants. It might seem counter-intuitive to water plants when a freeze has been forecasted or after the frozen ground has thawed, but that might be just what they need. Containerised plants and plants supplied as bare roots that haven’t been in the ground long are particularly at risk. I’d love to have that Tardis I often fantasise about to visit some of our best winter gardens while they are covered in snow. I’d need one to sneak inside the gates when the snow was at its thickest earlier this week. You might expect a winter garden to shrug off a bit of snow, but they often have to close because of access or other safety reasons. The nearest one I know of, Dunham Massey, was closed on Wednesday when I thought about trying to get there and even I could see it was not sensible to think about crossing the Blubberhouses to get to RHS Harlow Carr or to make the 200 mile round trip to Bodnant Gardens (which was also closed at one point). Which brings me to my final tip: always check any garden’s website and Twitter account before visiting at any time of the year. There are all manner of nasty surprises for the unwary – gardens that don’t open on certain days, or only in the afternoons, gardens closed because of high winds or flooding, areas closed off for film shoots, special events or weddings, to say nothing of the many UK gardens that close entirely for the winter. That’s why our winter gardens are so special, with or without snow. You’ll find news of any treats on offer too: exhibitions, special events (snowdrop open days spike this month), gardening tours and talks, and, looking to the future, late summer openings which I believe every major garden should offer at least once each year. We can always dream, can’t we? I’ve noticed a few of these plants…here in Michigan we have the red twigged dogwood and the birch and evergreens. But we don’t have any (that I know of) winter flowering bulbs. Plus the deer would eat those anyway. But still, I agree snow on plants make for some pretty pictures! Do you have the same bulbs, but they just flower later in the year? Snowdrops, iris reticulata, eranthis, cyclamen etc (deer permitting)? I am so thankful for the Internet as a gardener, it is my best resource. I can now check up on gardens for visiting as you suggest, find exactly the plant I want to buy-and buy it without leaving home. I can research the growing needs of any plant without the need for a library of gardening books, and I can encounter other gardeners all across the globe. You wouldn’t think it, but the WWW is a gardeners greatest ally in the 21st century! And for me, winter gardens are often best enjoyed in the warm, with my laptop on my knee and a cuppa in my hand! You make lots of good points. You can often find recent pictures or comments to help you work out when is the best time to go if you love a particular type of plant and want to catch it in flower. I love gardens in winter, not only are they quieter but you also get a real feel of the design. Especially if you have a good imagination and can almost see the plants in flower, just by looking at the leaves. Where plants are dormant or deciduous the red twigs really stand out.I hadn’t noticed how the growth appears – just that they are very different with leaves etc. I’ll have to check that out. If coppiced, new growth has no choice but to come up from the ground. The new twigs are what color so well the following winter. coppicing is probably the best way to prune them, but is not an option for us. In the wild, those that do not get coppiced put long new canes out from the top. These canes flop over to the ground where they root into new plants. It gets quite messy, which is good for the quail. Wonderful color and texture in the first picture. I am in the school that only plants what grows. With our harsh winters, I expect this is true for many Maine gardeners. I dare say so – it must be like fighting the waves where winter is really harsh. You’d be surprised by how many plants do well under a cold but cozy layer of snow. I have never been a great fan of Skimmia but seeing that photo from Dunham Massey’s winter garden with the grasses and is it dogwood, it really looks great. I had not realised that there are male and female plants until recently. 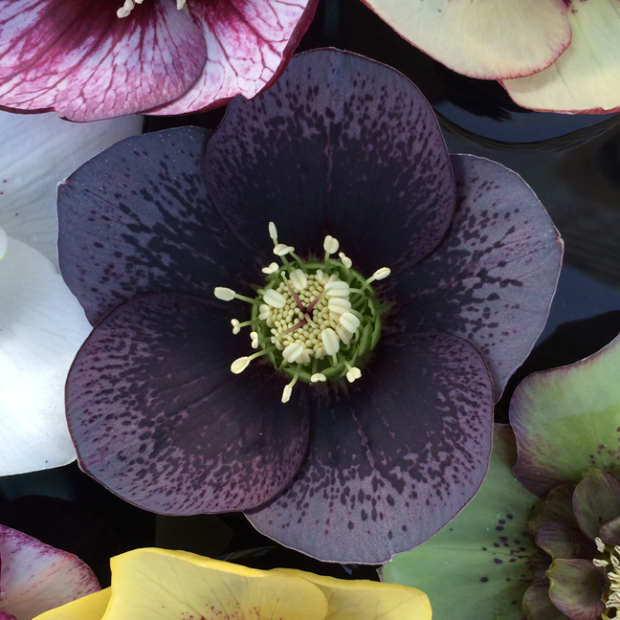 The Helleborus foetidus (Stinking hellebore) is beautiful. Three months until we see something (other than cold and snow I mean). Thank you for showing me these lovely bits of colour. I’m very happy to share! They are elegant plants. I really want to like winter gardens, but can’t help but long for spring and summer’s lush growth. Somehow colourful stems don’t quite cut it. But I really do need some garden visits and you have inspired me. Next weekend I am going in search of snowdrops and hellebores! 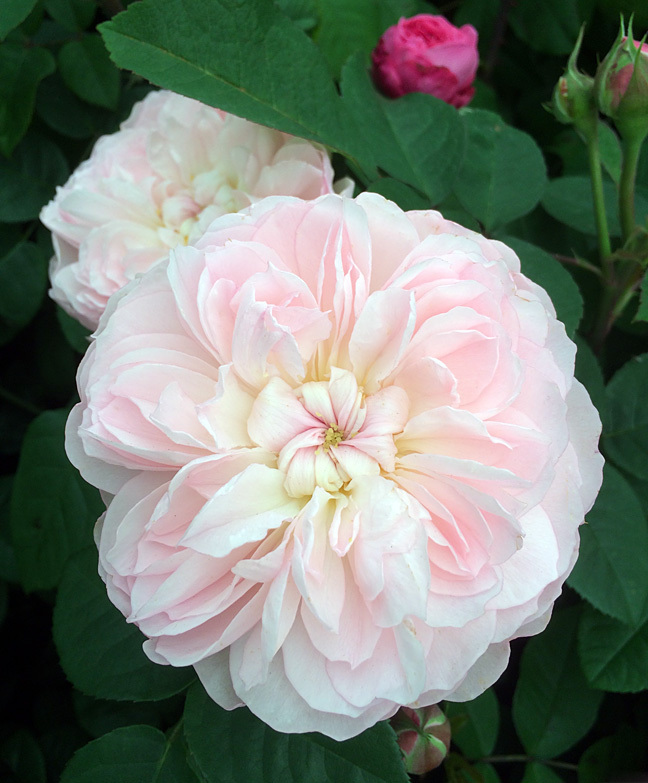 I didn’t find shrubs of any shape or form interesting at one time, setting aside shrub roses of course! The more winter gardens I’ve seen, the more I like them. We managed to get to Dunham Massey at the weekend before the snow had melted. The entire concept of “winter garden” is bewildering to me; I am of the mind that either it’s winter or there’s a garden, so I am fascinated by your photos. 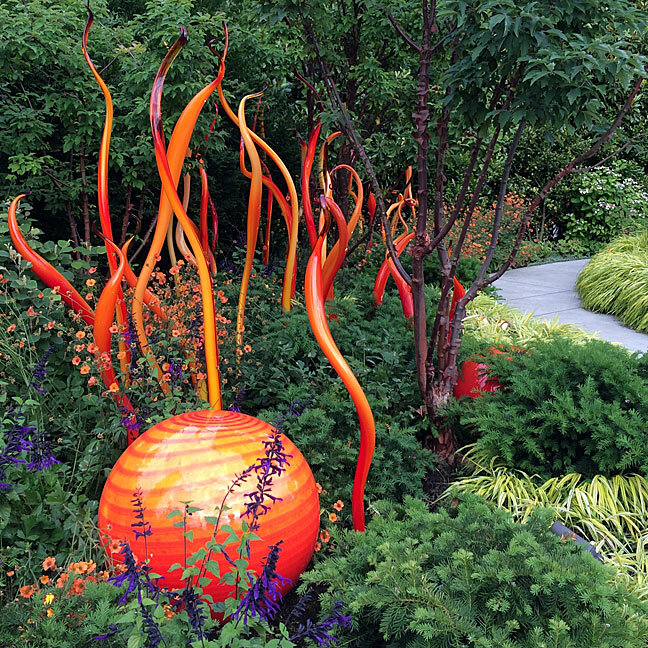 To have an area so colorful and interesting in the winter is an aspect of gardening I’d never thought about. As a bonus, it did my heart good to see the squirrel-proofing on that pot. Outsmarting garden marauders is so satisfying! I can understand that in a really cold, snowy climate the plants would need stilts – there won’t be too many pollinators around for them either. They are increasingly popular over here. Plant stilts! Brilliant idea! The idea of the winter garden is brilliant also, and I can certainly understand its popularity. Yes, we can all dream, and your photos are making it so much easier! I need to add some winter color around here, I’m currently hunting down sources for a few new witch hazels, but the dogwoods are always so interesting as well. We never have a shortage of snowy days here, feel free to hop in that Tardis and visit if you feel the urge! I wish! Good luck sourcing the plants. I like the orange-red witch hazels best, but the yellow ones seem to do better. Perhaps it is just that their colour stands out more. I have a similarly based suspicion of cotoneaster. Even the berries don’t move me. Yeah, that one doesn’t do much for me either (despite so many people telling me to use it!). Someone just needs to work on brightly colored stems/twigs for all the other great shrubs out there!